This week’s news picks include business predictions, social media, and search engine technology. 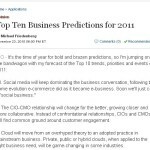 While many of us are getting ready to receive a deluge of family and friends for Thanksgiving, Michael Friedenberg has been busy compiling a list of his top ten business predictions for 2011. This is not your basic list though. Michael clearly states just how his predictions are going to have an impact, and why businesses ought to consider implementing them. Included in the list are social media, the cloud, real-time analytics, security breaches, and many more.